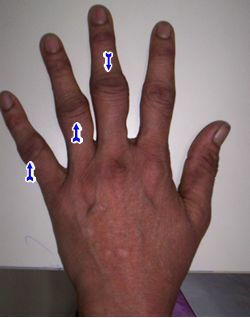 I am in the onset stage of Rheumatoid Arthritis. This is a new situation for me and I am currently trying to navigate the emotional and physical terrain that comes with having RA. Rheumatoid Arthritis is an autoimmune based disorder. It can affect children as well as adults. A fact that I did not know until it became necessary to do research on what it is and how it affects the body. This form of arthritis is one of the most painful because the joints become inflamed and swollen. I have had a light sample of that and it is a level of discomfort that I have never felt before. I have just begun to share this news with friends. One of the common attitudes that I have encountered is the idea that arthritis should be expected because I am aging. RA is not due to aging. It is due to the white cells acting in a manner that is not in harmony with how the human body is supposed to function. The cells identify the joints and muscles as an alien source within the body and attempt to do the work that they are designed to do. They attack the joint linings, kill the cells, and cause a level of pain that is surreal. The level of discomfort that I am currently experiencing has required me to make some major adjustments in my life. I have been on an emotional rollercoaster. This is not uncommon in the early stages of RA because I feel fatigued, in pain and like everyone else on the planet, I have an agenda that requires me to do different things. Being social is not high on my list of priorities. I have had to politely decline invitations to do things because I am not in the mood to do any interacting with people at this time. My current schedule includes physical therapy and visits to my podiatrist and primary health provider. I am about to add on visits to a rheumatologist to my calendar. In addition to exercise classes because movement is required daily. Along with allowances for recovering from feeling fatigued and somewhat overwhelmed by uncertainty. There have been moments when I have felt like going off on well-meaning friends who feel that I can just reach inside of my “strong Black woman self” and carry on as if nothing is happening. Let me be real clear about this. I do not identify as a SBW. I did at one time and the results did more harm to me emotionally and physically than I could have ever imagined. After recognizing that this was not healthy, dropping that shroud off of my womanhood was no problem. I admit that I have to keep myself in check because it is always present and willing to rise up to perform. However, I feel that a SBW is a woman who does not include self-care and her well-being as a part of the tasks that she must perform. Quite frankly, at this point in my life, I am #TeamLadyD all the way! This is certainly not what I expected to have going on at this point in my life. I am currently enrolled in an online business course. I work part time and I have an agenda that includes writing, reading, and developing an at home business because I really do not see myself returning to the traditional workforce again. This does not mean that I do not need the income that is generated by working. I discovered that the ritual of getting up daily to prepare to go to work, performing a job, and commuting back home for forty hours is not what I feel like doing again. I have to make some different plans as I continue to age. At this point in time I have no true idea how RA is going to affect my overall physical health. It can be managed. I am looking forward to meeting with the specialist and developing a plan to manage the pain. I am preparing to find out what resources within my community are available to support me. I realize that even if I want to handle this disease all by myself, it is not going to be possible. I am hoping that within the next few weeks to have information that connects me to the networks that I need. I am also looking forward to a call to set up an appointment with a rheumatologist. Until then, I have to move slowly and carefully each hour of the day.